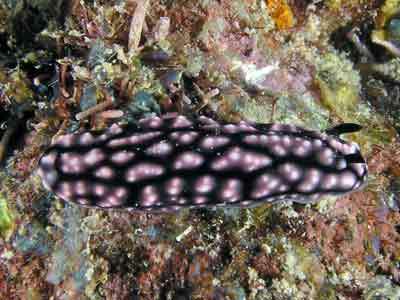 This is the most popular dive site in Port Vila, Vanuatu. It is located out past Iririki Island and past Ifira Island. The site consists, not unexpectedly, of two coral bommies that sit on the top of a flatish reef. To the north it slopes off deeper. There are a couple of moorings at this site, one owned by each of the dive operators. The Nautilus mooring is located at GPS S17° 45' 25.7" E168° 16' 55.0" using WGS84 as a datum. This mooring is located on the south side of a gutter that runs west-east. This gutter has broken coral on the bottom. It is about 12 metres here. From the mooring, you head north and go up over a slight ridge and then drop back to 12 metres. After about seven minutes you will come to the drop-off. 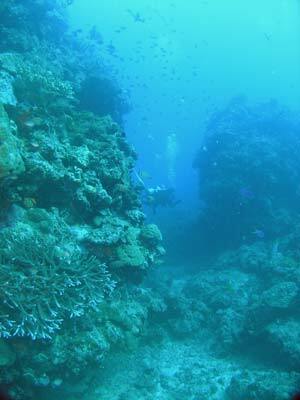 Here the reef slopes fairly steeply to about 30 metres or so. It is only worth going to about 25 metres. Turn right once you reach this spot and head east. You can gradually drop from 12 metres to 22 metres. 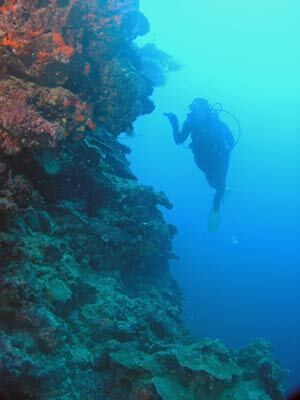 At first, the reef has a steep slope to the north but after about 50 metres there is a shear wall. This turns a bit to the south-east. Along this section of the reef there are a couple of small indents. These can have a lot of fish. 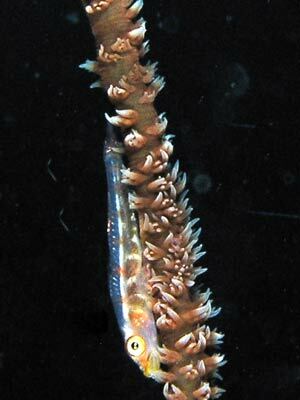 There are some small gorgonias, lots of small coral outcrops and some sea whips. There are also some interesting fish, including titan triggerfish, along here. 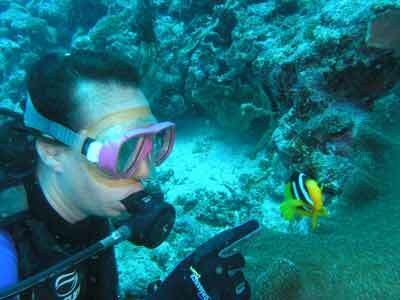 You will also see some bannerfish and butterflyfish. The reef turns to the south near here. You go up over the wall and soon come to the Twin Bommies. The depth rises to 20 metres and then gradually to 15 metres. The Twin Bommies are two coral bommies that rise up about three or four metres from the bottom. They are not huge, only about five metres in diameter. The area around and between the bommies has a lot of fishlife. The southern side of the eastern bommie has a huge amount of fish. You can spend a lot of time around the bommies. There can also be crayfish under the bommies. There are also a few anemones between the wall and the bommies. Some of these have the friendliest Clarks anemonefish (clownfish) you will ever come across. 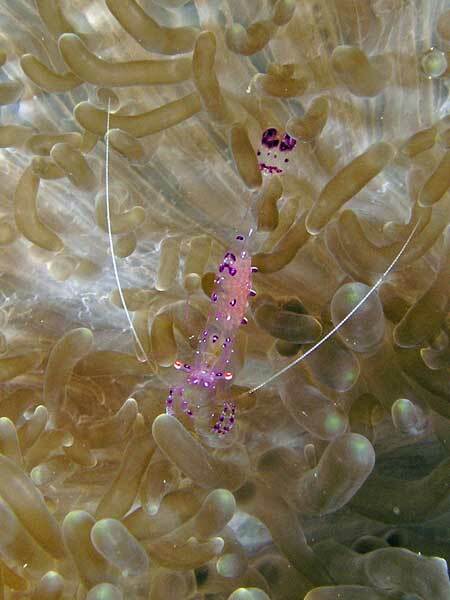 There are also clear shrimp in some of the anemones. Once you have finished with this area, you head west and soon come to the mooring. You can spend any remaining time in this area before ascending. 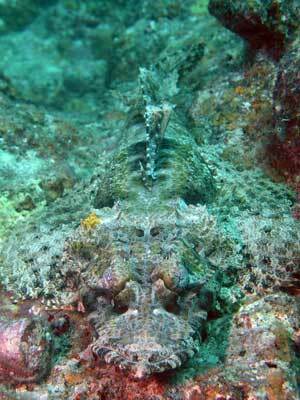 On one dive here, we saw a couple of crocodilefish in this general area. 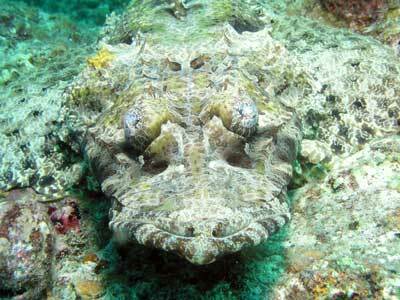 Amazing looking fish! This is quite a good dive site. Visibility is normally about 20 metres and water temperature between 26°C and 28°C. It is well worth doing once on your trip to Port Vila.